The Turk team were responsible for the complete transportation and port operations including receiving the cargo from the ship’s hook and unloading at the rig site. The biggest piece had dimensions of 20.19 x 4.65 x 3.91m with a weight of 56tns. Other units with smaller dimensions had weights ranging from 45-52tns. In addition, Turk is contracted to supply equipment and manpower on a regular basis to mobilise the units during rig moves. 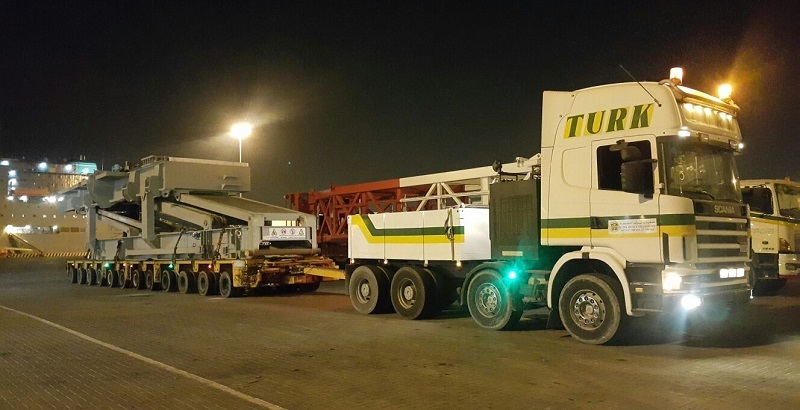 Turk Logistics & Heavy Transport – your reliable, professional partner in the Kingdom of Bahrain for heavy lift projects by air, sea & road.